Council Leader Bill McIntosh went walkabout on Maybole High Street recently with Peter Mason, chair of Maybole Bypass Committee, and David Kiltie, chair of Maybole Community Council . 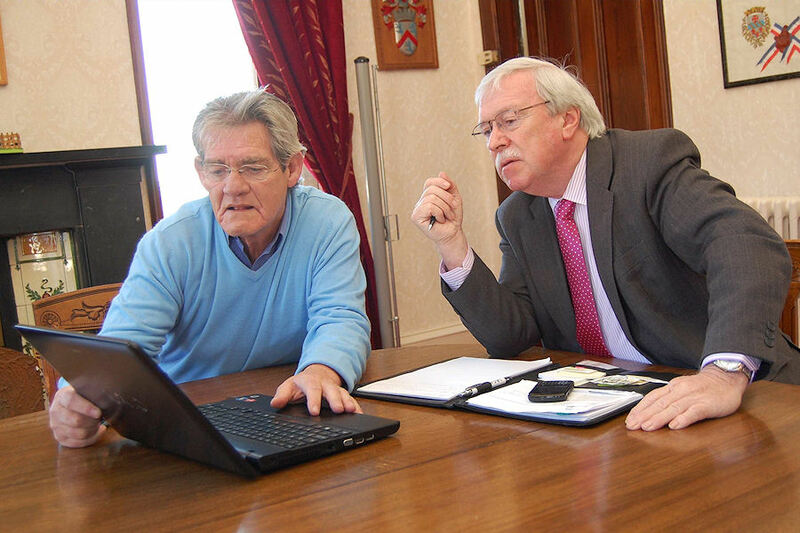 Afterwards they discussed the campaign to establish a start date for the bypass and Peter Mason showed the Leader the bypass web site on his laptop computer. 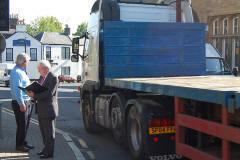 Mr McIntosh later wrote to Mr Kiltie saying, “The case for a bypass is compelling. 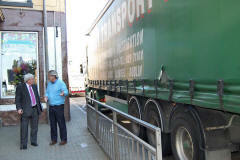 The A77 is a major trunk road carrying significant volumes of heavy goods vehicles en route from Ireland. This is augmented with traffic moving through South Ayrshire and local traffic within Maybole The combination is excessive and incessant traffic through Maybole High Street with all the associated noise, fumes traffic, and road safety hazards. As a Council, we have a strong commitment to tourism. Maybole is a lovely conservation town steeped in history and with strong Burns connections. However, the scope for Maybole to prosper in the current tourism market is severely limited by the current traffic situation. Air pollution is also adversely affected which runs contrary to our strong commitment to sustainability. Additionally, a bypass would bring economic benefits. Travelling through Maybole on streets built centuries ago is adding to journey times and fuel consumption for the HGVs travelling between Ireland and Scotland. Benefits would therefore extend beyond local benefits for South Ayrshire and would increase access to business throughout the 2 countries. 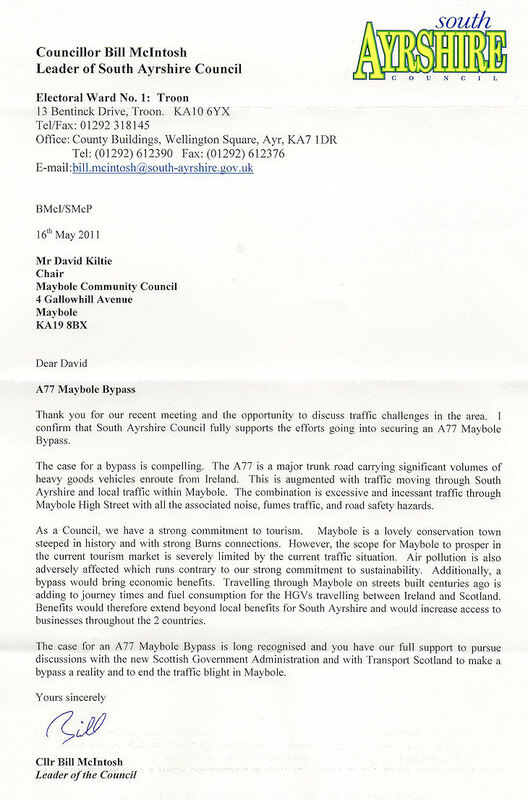 The case for an A77 Maybole Bypass is long recognized and you have our full support to pursue discussions with the new Scottish Government Administration and with Transport Scotland to make a bypass a reality and to end the traffic blight in Maybole. On behalf of Ayrshire Chamber of Commerce & Industry, I welcome your comments in the Ayrshire Post regarding the necessity of progressing with the Maybole bypass. 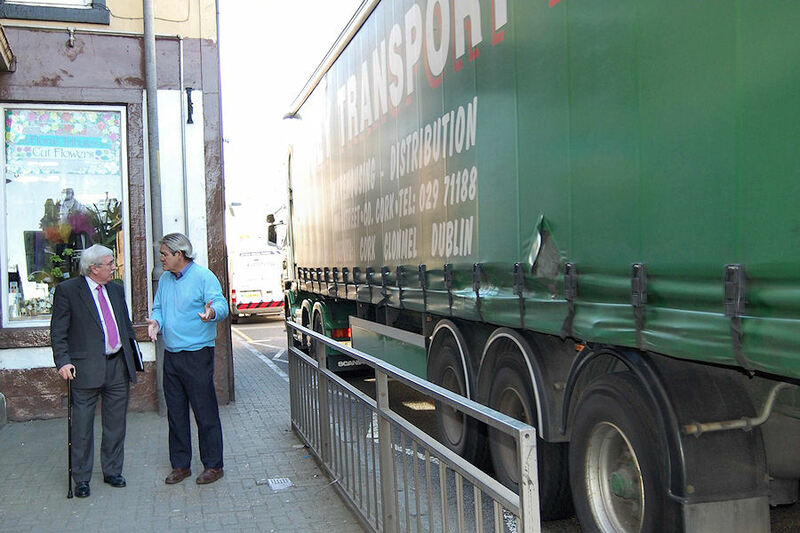 There is a significant amount of collated evidence of accidents which occur in Maybole involving both vehicles and pedestrians; loss of income to local businesses as people prefer to shop elsewhere; and the structural damage to historical buildings. The local Community Council has been very active in seeking support for the bypass and the Chamber has been supportive of their actions. As the bypass has cross party support and is also supported by the local businesses it would seem appropriate that a timetable be developed for construction to start. Given there has been a significant saving on the cost of the Forth Replacement Bridge project, we would ask that some of this saving be allocated to the Maybole bypass which was costed at £28-30 million some two years ago. There is an estimated 30% increase in traffic expected on this road when the new Cairnryan port is complete which makes the project more acute and urgent. Ayrshire Chamber welcomes your statement and looks forward to a timetable for implementation.